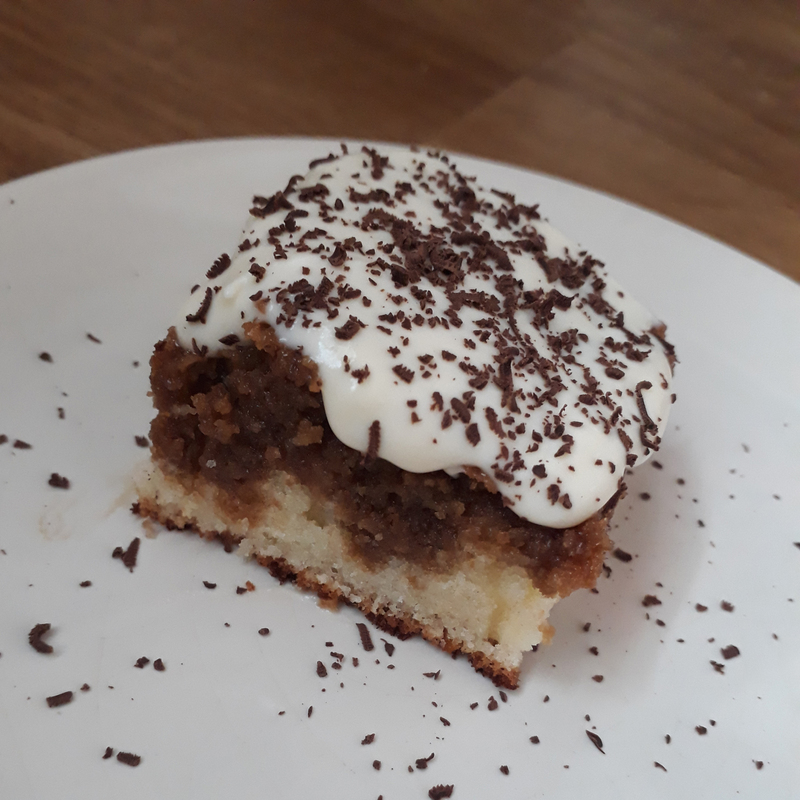 This is a great cake because it tastes like tiramisu but also this recipe has a FANTASTIC cake base. The base of the cake is made pretty differently from how I’m used to making cake and uses a ton of eggs in order to get its lift but it makes such a nice, springy cake that it’d be great for many other uses. Preheat oven to 350°F/180°C and grease a 9×13-inch pan. In a large bowl whisk eggs on high speed until combined and starting to foam, then add sugar and whisking until tripled in volume. Add milk and butter into the egg mixture in a slow, steady stream. Add flour, baking powder, salt, and vanilla to the egg mixture and mix until batter is formed. Pour the batter into the cake pan and bake for 25-35 minutes until a skewer inserted into the center comes out clean then remove the cake from the pan and allow to cool completely. Make the coffee syrup by stirring together hot coffee and sugar until sugar is dissolved, then add liqueur and cool. Brush the cake with coffee syrup or pour the syrup over the cake slowly and gradually, allowing it to soak in. Use all the syrup. Make the frosting by whisking together all the ingredients until stiff peaks form and then frost the cake.